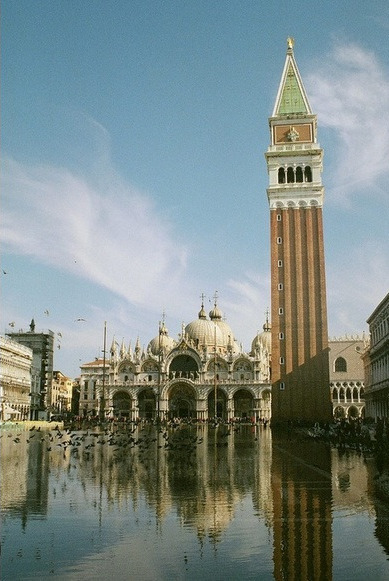 St Mark’s Basilica crowns the head of the Piazza San Marco; it’s the most irresistible church in Christendom and the national shrine of the Venetian state. Squint at it, and imagine the three great banners in front as sails, the Campanile tall and straight like a mast, the ship’s exotic cargo wrapped in fairy domes splashed by a roofline, where, as Ruskin wrote, ‘the crests of the arches break into a marble foam, and toss themselves far into the blue sky in flashes and wreaths of sculptured spray…’, while the four bronze steeds breast the waves, like figureheads, or like sea horses themselves – the ideal temple for a seafaring people with a marked inclination towards piracy. The first St Mark’s was a wooden chapel hastily erected in 828 to house the Evangelist’s relics just in from Alexandria. It was a decision of major importance to make his shrine the ducal chapel: not only did it declare an official move away from Venice’s former (and Greek) patron saint, Theodore, but it also established the special relationship between St Mark’s relics and the doge, his vicar and patronus et gubernator. The official hierarchy of the Roman Catholic church had almost no say in the Basilica, where the doge served a role similar to the pope in St Peter’s. For St Mark’s was the core and vortex of the Venetian state; the glory of ‘Messer San Marco’ was the glory of the Republic and vice versa. The first wooden chapel burned, along with the ducal palace, during the bloody insurrection of 976, when Doge Pietro Candiano IV was assassinated at the church door. Both the chapel and palace were immediately rebuilt in the same form, but the chapel was soon regarded as inadequate, and torn down in 1063, under Doge Domenico Contarini who sent out the simple order: ‘make the chapel the most beautiful ever seen’. Each merchant was to bring back some embellishment; each doge was to donate large sums to its perfection. A Greek architect from Constantinople was hired to design the new church, asking in payment that the Republic erect a statue of him. But when the Senate criticized the result as a botched job, the poor architect fell from the scaffolding in dismay. And so, the legend goes, the Venetians carved his likeness over the main door, leaning on his crutches, ruefully biting his fingers. 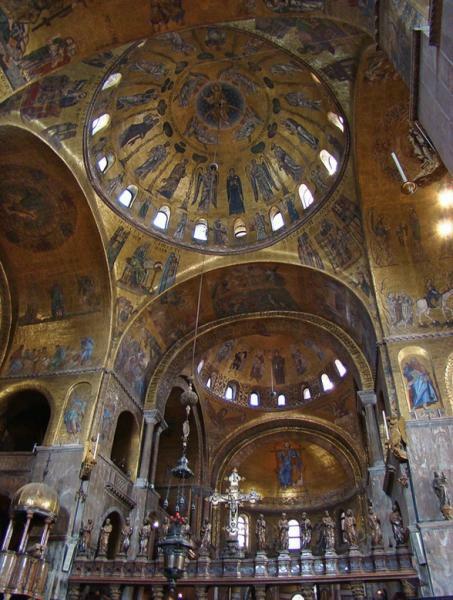 His model for St Mark’s was the no longer extant Church of the Holy Apostles in Constantinople, the imperial mausoleum of Byzantium, where Constantine and the first emperors were buried (it also inspired the ruined Basilica of St John at Ephesus, and St Front in Perigueux, France). 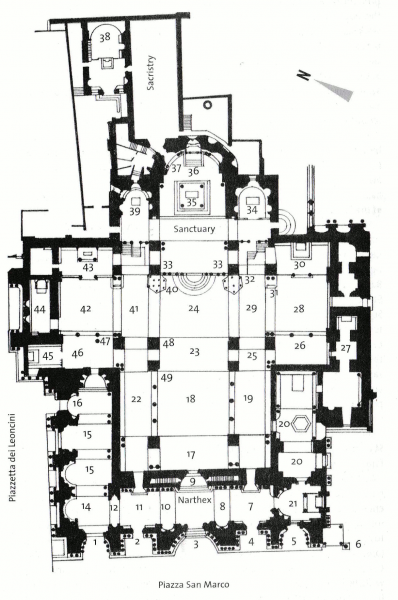 It is in the form of a Greek cross with cupolas over the centre crossing and over each of the arms, with a narthex wrapped around the front to the transepts (though the right narthex is now closed), and five doorways, doubled by the arches over the loggia. Originally these arches were brick (like the rest of the church) and pointed in the Gothic style, but after the conquest of Constantinople, when Venice became the ruler of its proud fraction of the Roman empire, it yearned to look the part. So the arches were rounded off, the brickwork sheathed in pillaged rare marble and stone, in the grand old Roman tradition. And could anything look more Roman than the triumphal arch of the central door, with the famous gilded horses of an ancient quadriga pawing the air? The only jarring notes in the Basilica’s millennial collage are the gaudy Technicolor mosaics in the arches, all cocky, painterly 17th–19th-century replacements of the originals – one of which was by Paolo Uccello. Sansovino, who in 1529 became St Mark’s Proto Magister (in charge of maintaining the church) had removed them to reinforce the structure. The only original mosaic to survive is the 13th-century lunette over the Porta di Sant’Alipio (the far left door) representing the Translation of the Body of St Mark, which not only tells the story of the relics’ arrival in Venice, but features the earliest known representation of St Mark himself. The bas-relief, wedged between this arch and the next, is a 3rd-century Roman one, portraying Hercules and the Erymanthean Boar (Hercules was the traditional tribal hero of the Venetii people); in the 13th century, Venetian sculptors carved an imitation Hercules and the Hydra to fill in the space between the right-hand arches. Between the inner portals are a Byzantine figure of St Demetrius (left) and another Venetian imitation of St George (right) – both Christian warrior saints – while the relief in the centre is of the Annunciation, depicting the traditional protectors of the doge: the Virgin and the Angel Gabriel. Best of all are the three bands of 13th-century reliefs around the central arch and its ungainly 19th-century mosaic of the Last Judgement. The carvings, however, are among Italy’s finest, uniquely flowing, complex compositions; even the Corinthian columns that support them seem to sway in the breeze. The outermost band of reliefs shows Venetian trades, from shipwright to fisherman (including the finger-biting architect on the left). The middle arch is devoted to the Labours of the Months, signs of the zodiac, and the Virtues and Beatitudes. The order of the months is interesting: note how the astrological signs are a month off; medieval astronomers (like astrologers today) still got their knowledge from the ancient Roman Ptolemy, though the stars have moved on; February for example—really January—has nothing to do but warm himself by the fire. The innermost arch is dedicated to chaos, including a vineyard filled with battling beasts and the favourite medieval fancy of a lady suckling a serpent. The upper loggia of the façade, with its unique horses (or rather, their copies), is crowned by statues of the saints, standing just out of reach of the late 14th- and 15th-century tidal froth and frills that so delighted Ruskin. Nor does any other church have so much loot embedded in its surface, picked up around the Mediterranean like exotic stickers on an old-fashioned travelling trunk: on the right corner of the loggia, you can see an 8th-century Syrian (or Alexandrian) porphyry bust of Byzantine Emperor Justinian III Rhinotometus (‘of the cut-off nose’); several aquarii with water pots on their shoulders serve as gargoyles. But the Piazzetta San Marco façade (the one most visitors used to see first) was the Republic’s main trophy case, bristling with a kind of braggadocio that in the 20th century seems almost charmingly naïve: there’s the Pietra del Bando, a stump of porphyry pinched from the Genoese in Syria in 1256, and used as a stand for the reading of proclamations, and every now and then as a pedestal for the heads of traitors until they began to smell. This is a twin to the stone in front of San Giacometto, Venice's business centre; proclamations and news would be read from both at the same time. In 1902 this stone became the hero of the hour for safeguarding the Basilica when the Campanile collapsed. Near this are two free-standing pilasters from Acre, decorated with rare Syrian curly carving. These were pilfered from the Genoese in 1256, and put here to get their goat, for the medieval Genoese treasured them as much as the Venetians treasured their quadriga of shining horses. 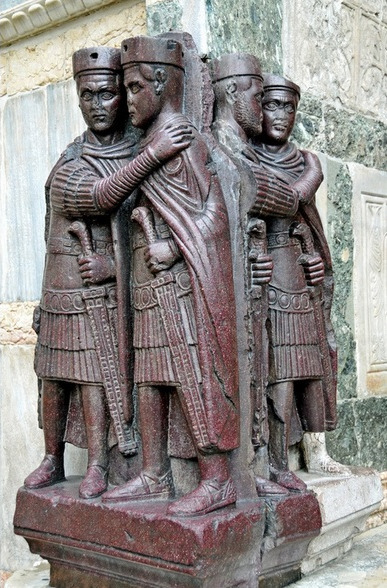 Four porphyry Moors, generally thought to be 4th-century Egyptian work, huddle on the corner; according to legend, they were changed into stone for daring to break into St Mark’s Treasury (the protruding part of the façade, believed to have once been part of the original ducal castle). The odds are that they’re really a pair of caesars and a pair of emperors—the tetrarchs, established with Diocletian’s attempt to divide the dying Roman empire into more governable sections, the better to persecute the Christians and overtax everyone else. Below is a crude sculpture of two putti coming out of dragons’ mouths, with the earliest known inscription in Venetian dialect: ‘Man can do and must think – and must beware what may result’. This profoundly banal dictum is seconded by the legend of the ‘Little Baker’s Madonna’ (a 13th-century mosaic of the Virgin in the upper lunette), whose pair of votive lamps are popularly said to be a reminder of the unjust execution of a young lad for murder – a true story, though the records attribute the lamps to the vow of an old sea captain lost at sea and saved by the Virgin. Among the other pretty things here are the colourful paterae, like artists’ palettes of coloured marbles and onyx, the 12th-century griffins supporting the columns of one of the arches, and the 6th-century Byzantine columns on the upper part of the façade, with capitals carved in the form of baskets overflowing with fruit. The north or Piazzetta dei Leoncini façade suffered from a band of rogue restorers in the 1860s, who decided that its sheath of polychrome marbles didn’t look quite as fine as the dingy grey stone – only an international campaign spared the main façade from their handiwork. Especially note the two bas-reliefs on the right: the Twelve Apostles symbolized by lambs, worshipping the etoimasia, the empty throne prepared for the Last Judgement, either a rare Byzantine work made during the Iconoclasm (7th or 8th century) or—as slippery as most of St Mark’s dates—by a 13th-century school of ancient art imitators. Nearby is a charming 10th- or 12th-century relief of Alexander the Great transported to heaven in a car pulled by two griffins, lured by pieces of liver dangled on spears over their heads – the moral of the story, of course, being that he failed, and you can’t get to Heaven on a piece of liver. Entering the Basilica's narthex, or porch, by way of the 13th-century Porta dei Fiori (on the north, Piazzetta dei Leoncini, side) is the tomb of Daniele Manin, who briefly revived Venetian independence as the 'Republic of San Marco' in 1848. Some of the basilica's most vivid mosaics are in the narthex's six shallow domes. These, mainly Old Testament scenes, are from the 13th century, made by Greek-trained Venetian artists, who learned their lessons well. The story unfolds from the right to left, beginning with the epic of the Creation and the story of Noah (who like any Venetian has a soft spot for the lion). Note the door on the right; the bronze Portal of San Clemente is an 11th-century Byzantine work, a gift to Venice from Emperor Alexios Comnenos. The narthex floor’s geometrical marble mosaic dates from the 11th and 12th centuries; by the main entrance, a lozenge marks the spot where Emperor Frederick Barbarossa knelt and apologized ‘to St Peter and his Pope’ – Alexander III in 1177. Barbarossa had tossed Alexander out of Rome and installed an antipope sympathetic to the imperial cause, but when his armies were disastrously defeated by the Lombard League he was forced into reconciliation, stage-managed by Venetian diplomacy – one of the few gold stars Venice ever earned with the papacy. Centuries later, the affair would become a Reformation rallying point. To the right is the oldest tomb in Venice, that of the doge who consecrated the Basilica, Vitale Falier (d. 1096) ‘King of kings, corrector of laws’ – an epitaph that would give a decaffeinated 18th-century doge a heart attack. On the left behind an Islamic-inspired grille is the Tomb of the Dogaressa Felicità Michiel (d. 1101); her exceptional piety earned her a last resting place in the Basilica. The central door into the church retains the rare, original 11th-century mosaic of the Madonna and Saints. Near here is the entrance to St Mark's Museum, aka the Museo Marciano and Loggia. The interior of St Mark’s is even more lavish than the exterior. Its lofty arches, shadowy walls, dizzy catwalks and swollen domes are covered with over 4,000 square yards of mosaics, a golden sheath that seems to breathe like a living thing when caught in the sun, and shimmers in ancient mystery in the evening shadows. On a high feast day, when all the candles and lamps were lit, the splendour would be overwhelming: the rich robes of the clergy, the heady fragrance of incense, the music of six orchestras of a hundred musicians each accompanying the celebrated Marciana choir: in fact, the basilica's unique structure, with its various galleries and subdivisions, led directly to the development of the Venetian School of music, founded by Adrian Willaert and reaching its climax under the great Claudio Monteverdi. After the pagan glories of the façade and the Old Testament theme of the narthex, the mosaics here are all based on the New Testament; begun in the 11th century, they have been constantly repaired and replaced ever since, a year-round, full-time job. The peculiar catwalks over the aisles were once the women’s galleries, chopped up to admit a bit of light when the side windows were covered up for more mosaics. When your neck begins to ache from gazing up into the domes, take a look at the intricate pavement of richly coloured marbles and porphyry and glass, its swirling geometric patterns subsiding into rolling waves and tidal pools. The first dome, the early 12th-century Pentecost dome, was also the first to be decorated, with mosaics representing the nations whose languages were given to the Apostles on Pentecost Sunday. Especially note the arch between this and the central dome and its exceptional 12th-century scenes of the Crucifixion, Descent into Limbo and Doubting Thomas. In the upper wall of the right aisle is another early 12th-century mosaic masterpiece, the Agony in the Garden, where the artist took no chances on portraying the correct posture of Christ – he kneels, stumbles, and falls on his face, according to the differing descriptions in the Gospels. Just below this mosaic, to the right, a door leads to the Baptistry. This was one of Ruskin’s favourite places, and the Gothic Tomb of Doge Andrea Dandolo (d. 1354) by Giovanni de’ Santi in front of the door, was his favourite Venetian monument. 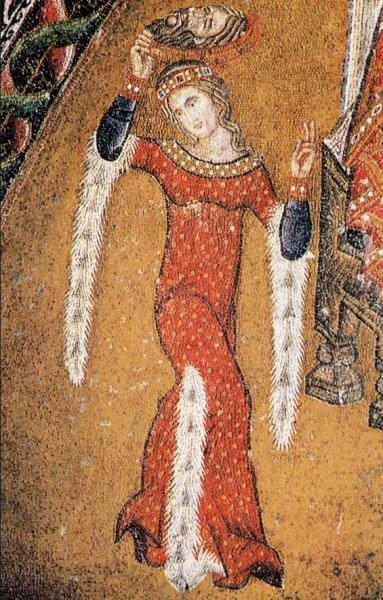 Dandolo, a man of refined tastes and a friend of Petrarch, was the last doge to be buried in the Basilica; among the mosaics he commissioned: charming, anecdotal scenes on the Life of St John the Baptist, with swivel-hipped Salome in a red dress, dancing in triumph with the Baptist’s head on a platter. Also buried in the baptistry are, to the right, Doge Giovanni Soranzo, Dandolo’s predecessor (d. 1329), and, under a slab in the pavement, Jacopo Sansovino, whose remains were brought here in 1929, to lie near the giant font he designed. The mighty block of granite by the altar was part of the booty picked up in Tyre in 1126, lugged into this holy place on the chance that Christ stood on it when he fed the multitude. A door from the baptistry leads into the Cappella Zen. The affluent Cardinal Giambattista Zen, like the condottiere Colleoni, left the Republic his fortune on the condition that he be posthumously recognized at St Mark’s – though the Cardinal was more specific, and to get their hands on his money the Senate ordered that the piazzetta entrance and narthex be closed in order to make him a chapel, and hired Tullio Lombardo to design it. The doorway, decorated with a pair of 11th- or 12th-century mosaic angels flanking a Madonna (a 19th-century copy), has mosaic niches with small but expressive statues of the prophets; in the vault overhead are mosaic Scenes from the Life of St Mark (13th century). Antonio Lombardo carved the high altar’s classical goddess with a child, the Madonna of the Shoe, in 1506. At the centre of the basilica, the main, Ascension dome has concentric circles of heavenly notables around the main event, with allegories of the Four Rivers of Paradise, spilling over, as most Venetians probably thought, right into their own lagoon of manifest destiny. Towards the right transept, note the 12th-century bas-relief of the Madonna dei Baci on one of the piers, a work nearly effaced by thousands upon thousands of kisses from the faithful over the centuries. The dome, dedicated to St Leonard, is relatively austere with its four saints, although note the lively 12th-century Scenes from the Life of Christ (Entry into Jerusalem, Temptations, Last Supper and Washing of Feet) shimmering on the arch between the dome and nave. On the transept’s right wall are mosaics, known as the Inventio (13th century) that show events that happened at the nearby altar of the Sacrament. After the disastrous fire of 976, it was commonly believed that St Mark’s body was lost in the flames. This blow to Venice’s prestige was exacerbated when the merchants of Bari beat the Venetians to the relics of St Nicholas of Myra (the patron of sailors). Something had to be done, and on 24 June 1094, as the new basilica of St Mark was being consecrated, everyone prayed fervently for the rediscovery of Mark’s relics, the good saint was made to miraculously reappear, hey presto! his arm suddenly breaking through the wall of the left pilaster (the exact spot indicated with a marble inlay and mosaic). Divine patronage re-confirmed, Venetian confidence would only soar to new heights. On the nave pier, to the left, is the altar of St James, a lovely work in the Lombardo family style. At the end of the right transept is the door, now locked, through which the doge would enter the basilica, topped by a giant Gothic rose window. The door with the ogival arch to its right leads into St Mark’s Treasury, housed in a room of immensely thick walls, believed to have been a 9th-century tower of the original ducal castle. To the right of the high altar is the large, oddly-shaped ceremonial pulpit, where a newly-bonneted doge would show himself to the people; here too is the entrance to the Sanctuary and Pala d’Oro. Straight on as you enter is the little alcove Cappella di San Clemente, with sculpture by the Dalle Masegne brothers and a pretty Gothic tabernacle on the side pier to the left. Eight bronze reliefs by Sansovino line the singing gallery of the chancel. Take a close look at the four columns supporting the baldacchino over the high altar. These are the subject of another Venetian mystery: made of oriental alabaster, and sculpted with worn and murky New Testament scenes, these may be Byzantine works of the early 500s, or 13th-century Venetian retro art; or perhaps, as legend has it, they were brought to Venice from Dalmatia by Doge Pietro Orseolo II in the year 1000. 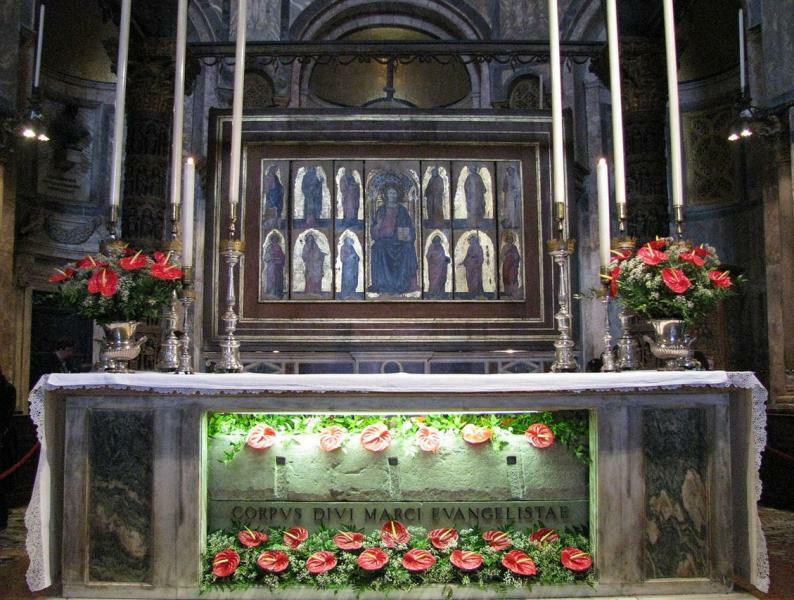 Under a bronze grating in front of the altar is the crypt containing the supposed relics of St. Mark. The dome over the high altar is another brilliant work of the 12th century, its subject The Religion of Christ Foretold by the Prophets, with the typically Byzantine Christ Pantocrator, blessing the congregation from the apse. Under this, between the windows, are four of the oldest mosaics to be seen in the Basilica, the 11th-century Saints Nicolas, Peter, Mark and Hermagorus; in the central niche is an altar with translucent alabaster columns. The left-hand niche has the sacristy door, with bronze reliefs by Sansovino of the Entombment and Resurrection; in the frame, Sansovino sneakily included busts of himself and his closest friends, Titian and the roguish Aretino. But the highlight, of course, is the dazzling and incomparable Pala d’Oro, the masterpiece of generations of medieval Byzantine and Venetian goldsmiths and the most precious treasure in the basilica. Measuring 10ft by 4ft, it consists of beautifully worked gold, set with 300 sapphires, 300 emeralds, 400 garnets, 100 amethysts, 1,300 pearls, not to mention handfuls of rubies and topazes to accompany 157 enamelled rondels and panels. The original altar screen was ordered from Constantinople by Doge Pietro Orseolo I in 976, and it was revised and enriched in 1105, again in Constantinople. In 1209, the Venetians enlarged it with some of the jewels and gold they had plundered, and it was reset in its final state in 1345 by Gian Paolo Boninsegna. The miniature enamelled scenes are microscopically intricate and well crafted, but tend to get lost in the razzle-dazzle: the large figure on top is St Michael, encircled by rondels of saints and six larger panels with New Testament scenes. Below, the dominant figure is Christ Pantocrator; this and the 39 niches filled with saints are 12th-century Byzantine, while the small square panels that run along the top and sides of the lower screen, with scenes from the lives of the Evangelists, are thought to be from the original 10th-century Pala; in the one in the upper right-hand corner, an angel greets St Mark from the future city of Venice. Before leaving the sanctuary, take a look at its magnificent rood screen of eight columns of twilit marble, holding the silver and gold Cross (1394) by the Venetian goldsmith Marco Benato and marble statues by Jacobello and Pier Paolo Dalle Masegne, perhaps the brothers’ finest works. On the left side is a second pulpit, built on another pulpit, made of columns of rare marbles and parapets of verde antico. Just within the left transept, vaulted by the 12th-century dome of St John, is the busiest chapel in St Mark’s, the Chapel of the Madonna di Nicopeia, festooned with hanging red lamps and candles glimmering in the permanent twilight. The chapel is named after the prodigious 12th-century icon of Our Lady, Bringer of Victory, which Byzantine emperors would carry into battle. Part of the haul of 1204, it has been venerated ever since as the Protectress of Venice. At the end of the transept is the Cappella di Sant'Isidoro, built by Doge Andrea Dandolo in 1355 to house the relics of St Isidore, stolen from Chios in 1125. In the beautiful, pristine mosaics on the upper walls and barrel vault that tell the saint’s story he seems glad to go, grinning as the Venetians kidnap him. Behind the altar his sarcophagus bears a 14th-century reclining effigy; by the door there’s a delightful holy water stoup. The next chapel in the left transept, the Cappella della Madonna dei Máscoli (‘Our Lady of the Males’, after a 17th-century masculine confraternity) not only has confessionals in four languages, but lovely mosaics on The Life of the Virgin (1450s). Based on cartoons by the Tuscan Andrea del Castagno and probably Jacopo Bellini, and carried out by Michele Giambono, this chapel was one of the seeds of the Renaissance in Venice; the scenes are set in the kind of fantasy architecture beloved by the Tuscans. A Gothic altar of 1430 is embedded in a wall of rich marbles, and the figures of the Madonna and St John and St Mark are by Bartolomeo Bon. Before leaving the transept, take in the Romanesque carvings on the Greek stoup in the centre and, on the pier, a relief of the Madonna and Child, with perhaps the most curious and unexplained ex-voto in Italy: a rifle. And on the first pier in the left aisle is Il Capitello, a tiny chapel constructed entirely of rare marble and agate to house a painted wooden Crucifix, believed to have once belonged to the Byzantine Emperor; abused by a blasphemer in 1290, it miraculously bled, and has been tucked in here to prevent further mishaps. From April-October (only), book online (€2 fee) to avoid standing in the long queues at the entrance.